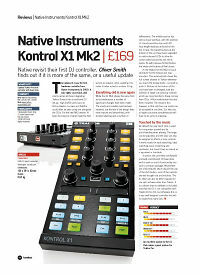 The original X1 was the fi rst hardware controller from Native Instruments in 2009. It was highly successful, and mainly aimed at those integrating Traktor Scratch into a traditional DJ set-up. High profi le users such as Richie Hawtin, Luciano and Dubfi re could often be seen using one alongside the CDJs. For the new Mk2 version NI keep the essence of what made the fi rst version so popular, while updating it to make it better suited to modern DJing. ID: 319462 © 1996–2019 Thomann GmbH Thomann loves you, because you rock!